(Bloomberg) Governor Andrew Cuomo’s seven-round limit on magazines sold in New York will be suspended “indefinitely” by a measure in his $136.5 billion budget set to be passed this week, Dean Skelos, a Senate majority leader said. This means they go back to the ban on magazines that hold more than 10 rounds. 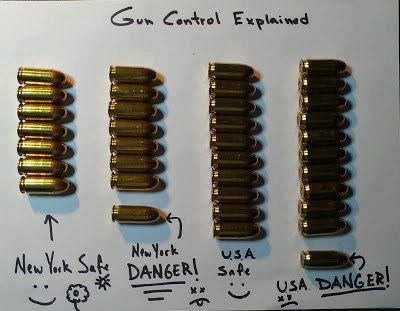 Why does Cuomo not want New Yorkers to be safe? Does it matter if no one makes 7 round holders? We’re making NY safe!!!!!!!1!!!!!!!!! See? Safe!!!!!!1!!!!! You can bet that this has nothing to do with no one making 7 round magazines, because that’s not what the law stated. It said you could not have more than 7 rounds in a magazine, meaning the 10 rounders are cool, just do not put more than 7 in one. Meanwhile, the NRA is suing the State of NY over the law, maintaining that it is un-Constitutional. Also, mental health professionals say the law is problematic when it comes to reporting those who might be a danger. It might cause people with issues to not discuss them with their doctor, case worker, psychologist, etc, because most are required by law to report the information to The State. Also, what they report could be a judgement call, meaning someone would have their guns taken based on the feelings of another person. And somehow, under the law, none of this is considered to be breaking doctor-patient confidentiality. Here’s another point: if the physician feels that the patient is a danger, The Government would come and take their guns, denying them their 2nd Amendment Rights even though the person in question broke no law. Also broken are the 4th and 5th Amendments, not to mention several provisions of the NY State Constitution. What if a mental health worker feels that being a Tea Party member is a threat? Or, conversely, being part of the Occupy movement? The police can just come by your home without a warrant and take your firearms. Does that sound like the American system, or more like something from Iran, Venezuela, Cuba, China, and other authoritarian countries?